HOW CAN I IMPROVE IN INTERPRETIVE READING TASKS? See below for strategies to apply in your next reading task. 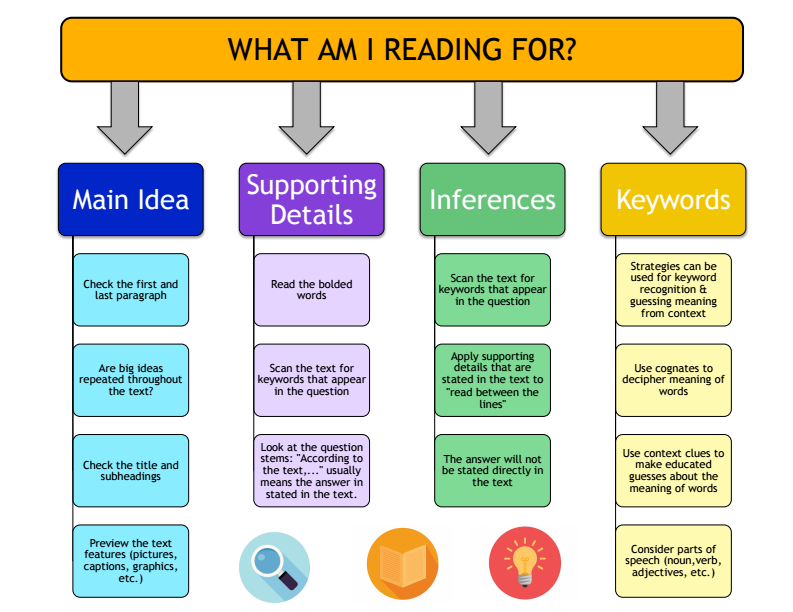 - improving your reading comprehension with many questions related to Main Idea, Supporting Detail Detection, Author's Perspective, Guessing Meaning from Context, Simple and Complex Inferences and more! - First, you will need to sign in using your school Google account to access the reading and quiz. - Before reading the article, select the appropriate level. *Hint - the higher the number, the more words and the harder the article. - Once finished, select the "quiz" tab on the blue colored strip and take the quiz to judge your comprehension! - improving reading and listening comprehension, vocabulary and even grammar knowledge! - On the main page for the article you can read the article and/or listen to someone read it at the same time. Use the underlined words to help you understand it. - Once finished, select the "lenguaje" tab at the top to access the summary (Versión Principantes), comprehension questions and grammar exercises related to the article. - You should also check out the "Multimedia" and "Viaja" tabs to learn more about the culture and country! NOTE - There are 2 buttons/links because there are 2 separate pages with exercises. NOTE: Most readings have practice exercises, but not all. If you choose one without a practice exercise at the bottom of the page, select another one that does. - On the main page for the article you can read the article and/or listen to someone read it at the same time.